This last week or so have been quite tough, and the coming ones aren’t shaping up particularly well, either. Well, baking a cake often helps. book I wrote about the other week. There’s a recipe in there for a maple and walnut pear cake, and those in the know will realise the significance of maple syrup in the context of our current situation, so it had to be that, made with a particular bottle of maple syrup, couriered personally from Canada a few weeks ago by my Dad. It’s a big bottle, nobody will be surprised to learn. 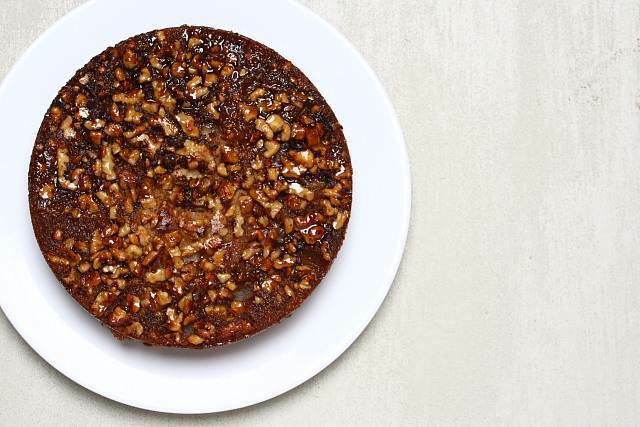 This is a cake with a bottom that ends up on the top, a layer of maple syrup and walnuts under, then over a layer of pears, sitting on top of a light cinnamon cake. With any luck, some of that maple syrup will leak through the pears into the cake itself when you turn it out. The topping goes in the bottom of the cake tin. Start by toasting about 50g of walnuts until they start to take on some colour, then chop them roughly. Set the nuts to one side, then weigh 60g of soft brown sugar into a pan, and add 80ml of maple syrup to it. Heat the pan gently until the mixture starts to bubble. Stir it often, and let it bubble away for a minute, then take it from the heat and pour the maple syrup and now-dissolved sugar into a 23cm cake tin. The mixture is thick enough to make sure that it won’t leak out of the sides of a loose-bottomed cake tin. Spread the chopped walnuts over the mixture in the cake tin. Next, peel, core and quarter three hard dessert pears before slicing them into slithers maybe five or six millimetres thick. Arrange the pear slices in the bottom of the cake tin in an overlapping pattern and set the tin aside for now. The cake batter is easy. Beat 115g of butter in a stand mixer or by hand until it’s light and pale, then beat in 100g of granulated sugar and 60g of soft, light brown sugar until the sugar is incorporated and the mixture is smooth. Beat two eggs into the mixture, one at a time, along with half a teaspoon of vanilla extract. Weigh out 210g of plain flour, and add a teaspoon of baking powder, two teaspoons of ground cinnamon and a half teaspoon of salt to it, mixing together. Add about half of the flour to the bowl with the cake batter and stir gently to mix. Add the rest of the flour, along with 125ml of milk and stir everything together until the batter is smooth and creamy. Pour the cake mix into the tin, taking care not to dislodge the carefully arranged pears, and bake at 180c for fifty minutes, or until a toothpick plunged into the heart of the cake comes out clean. Leave the cake to stand for fifteen minutes or so, and then run a knife round the edge of the tin to dislodge anything that’s stuck and turn the cake out. Gently prise off the base and scrape any rogue walnuts back into place. This is a cake best eaten warm, so don’t hang around. This is a great cake to serve with tea or coffee. The ingredients are easy to find and combined they sound so delicious. Thank you so much for sharing it! The cake looks wonderful. I adore the recipe. This is like the perfect fall flavor round up! Sounds so delish! This looks lush! Anything with pear and walnuts is pretty much a guaranteed win. I love holiday-present maple syrup too, complete with maple leaf shaped bottle and everything. This cake looks delicious. I’m bookmarking this one. This cake looks wonderful….. I love the pictures. This is so beautiful–just brimming with some of fall’s best. This looks absolutely marvelous! I would love to make this sometime and I am going to save it for later. I recently made an apple pie that had pecans and brown sugar on the bottom and then was flipped over to serve. It was divine and this one looks even better! Thanks for a great recipe! I’m a huge fan of David Lebovitz. I’m completely stalled on his ice cream book at the moment, as I seem to be making every single recipe in there before I can feel like it’s safe to move on to one of his other books! Oh my goodness. How did I miss this last visit? I love pears and I love maple. This look incredible and I want to eat it now. There are some pears sitting on my counter just begging to be made into this wonderful cake. Great job. Now I just have to use my rusty math skills to translate the measurements into American-ese. Thanks for posting this. Just letting you know, I tried this and it was a hit! I did not have the most flavorful pears but it was still very tasty. Thanks for sharing.